Was $175.99 You save $100.00! Great for parties, weddings, DJs, and other festivities, this 4-Pack of 1-Gallon containers of Chauvet Bubble Fluid help create an artistic and fun atmosphere at your event. This bubble fluid is just what you need to get the party started. 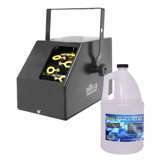 It is formulated specifically for use in all bubble and fog machines. They are 1-gallon containers that produce high-flying and non-staining bubbles. This liquid is non-toxic, non-flammable, and unscented. Blow some clear air circles of fun at your event with your bubble machine using this 4-Pack of 1-gallon containters of Chauvet Bubble Fluid. This works great - I bought it to use for next Christmas for my over the top Light Display. This will be a new addition to my Christmas Lights display. the kids that come up my driveway already enjoy the laser lights. Now we'll have bubbles blowing on the driveway. It works great. Thanks.